Eat, Drink, & Be Wild @ WaZoo!!! Greetings again everyone!! Jessica back with another awesome Tampa Florida atrractions update for you (and this one is for everyone this time!)... 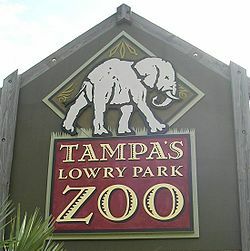 And yes, this Tampa Bay events got everythings you&apos;re looking for -- it&apos;s time to start getting ready to tame your taste buds as they go wild for Tampa&apos;a Lowry Park Zoo&apos;s 14th Annual WaZoo celebration! Much like the Florida Aquarium Sudsfest (which you all heard about), the Lowry Park Zoo holds an exciting annual beer festival tagged "WaZoo." Several bay area restaurants provide a tantalizing selection of local cuisine, while guests can party or just kick back and relax with a variety of live Tampa Bay entertainment throughout the evening. All proceeds from this event benefit animals at the zoo... what a great cause! But wait! There&apos;s more you should know... Tampa&apos;s Lowry Park Zoo&apos;s WaZoo has been named a Top 10 Beer Festival in America by USA Today! -- WaZoo features samplings of more than 200 beverages from around the world and a beautiful wine garden. Also, don&apos;t forget about the new Beastly Beverage Club offering access to the NEW Safari Lodge for only those ticket holders. This VIP area is the only air-conditioned space in the event and features: your own DJ, extra food and specialty beers and more in a beautiful venue. But, hurry because these tickets are first come, first serve and are only available to a limited number of guests. If you are interested in learning more about this wild event or purchasing tickets online, feel free to visit <lowryparkzoo.com/wazoo> But I assure you we will be talking about this event much more between now & August! Check back for more Tampa tourism... CHEERS!